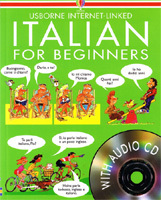 This lively and entertaining book and CD pack is the perfect resource for complete beginners and intermediates wanting to improve their Italian. The book, with its humorous illustrations, teaches everyday words and phrases as well as important grammar concepts. Each track on the accompanying CD follows a double-page spread in the book, so children can listen to the phrases as they read, improving pronunciation at the same time. There are also puzzles and exercises to help reinforce the new language learnt. Intended for ages 9 to adult, this pack is suitable for complete beginners but would make also make excellent revision material for anyone wanting to improve their Italian. This pack is suitable for children to use alone, or could be used for a younger child with help from a parent. Adults - don't let the cartoon pictures put you off using this for yourselves!! It makes a great starting point for all ages!